These Opportunities Don't Come Around Very Often! Rare 800+ Sq Ft Cabin, Across From the Lake in The Sought After Arrowhead Lakes Community. With Rustic Adirondack Siding, Stone Fireplace and Gigantic Sunroom Off The Back You Can Sit On Your Front Deck, Sipping Your Morning Coffee and Watching the Tranquil Stillness of Big Arrowhead Lake. For Complete Details and Pics Simply Click Here! This Center Hall Colonial sits on one quiet acre in Cul De Sac. Home nicely appointed, light & bright.Three bedrooms, 2.5 baths, Propane heat and forced air A/C. Large Country Kitchen and full appliance package. Pergo floors and Berber w/w.Full master B/R suite, with walk in closet.Large two car Garage. Miscellaneous : Cert of Occ Req'd: No; HOA Fee: Y; HOA Fee/Year: 250; HOA Transfer Fee: Y; HOA Transfer Fee Amt: $87.50; 1st Right of Refusal: N; Access: Private; Zoning Code: Res. From time to time, as we deal day to day with the hustle and bustle that winds up defining our lives or as more commonly referred to as The Rat Race the thoughts of a relaxing weekend away in the mountains is sure to enter into our thoughts. If you are in the Tri State area, New York, New Jersey and Pennsylvania then your thoughts have definitely drifted to the Pocono Mountains in Northeast PA.
With the new influx of investment into the Pocono Mountain Region in the way of luxury spas, casinos and more, The Poconos have once again become THE PLACE TO BE! If you want to experience that mountain goodness of nature, crisp water ways, fabulous fishing, awesome golfing and more then you have definitely dreamed of owning your own Weekend Getaway in the Poconos. Next stop? Finding a Professional Who Knows the Different Lake Communities here in the Poconos! There are many wonderful lake communities to choose from and this article is dedicated to Locust Lake Village, Pocono Lake Pa's Premiere 4 Season Resort Lake Community and even more importantly this article is focused around the Best-Buy-Home-For-Sale-in-Locust-Lake-Village, 631 Oak Terrace. This 3 Bedroom and 2 1/2 Bath Country Cape is in Perfect Condition and Will Appeal to Everyone with Full Master Suite located on the First Floor. 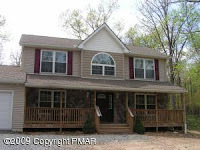 The picture above is my latest listing here in Pocono Lake PA. Located in the fabulous lake community of Arrowhead Lakes it is not only a Gorgeous Colonial Home but Comes Completely Turn Key with a Gorgeous Short Term Rental History! Check out all of the Photos and Details by Clicking Here! The Property Pulled in $26,000 in rental income in 2008 from Vacationers Flocking to Arrowhead Lakes. 2009 is proving to be right on course and possibly a little better. If you know of anyone looking for the perfect Investment Opportunity then send this to them or give them my number. In 1877 four men accused of being Molly Maguires were hanged together on gallows inside The Old Jail Museum. In 1878 and 1879 three more accused Molly Maguires were hanged there. The men swore they were innocent. One man, to prove his innocence, placed his hand firmly on the wall of his cell. He proclaimed his handprint would remain forever as a sign of his innocence. The Handprint is Still On The Wall of Cell 17 Today! Built in 1871, The Old Jail Museum contains 28 cells, the warden's living quarters and 16 eerie dungeon cells. The reconstructed gallows follow original descriptions. The Old Jail Museum was the county jail until January 1995. It is an excellent example of 19th century prison architecture and is listed on the National Register of Historic Buildings. Weekend Tours only in September and October from Noon to 4:30 p.m. The Unofficial Start of The Lakefront Home Buying Season! Well Happy Autumn Everyone! Although it is not officially Fall yet I am eagerly awaiting the change of colors of all the trees here in the Pocono Mountains. Northeast Pa is probably the most majestic of places in the FALL! As is customary here in the Poconos, the Fall Season ushers in the "Unofficial Lakefront Home Buying Season". I'm not really sure why but my theory is that the present owners of these 'soon to be for sale' lakefront homes want to get them on the market but use them one last summer and after summer they put them up for sale. I went to look at two of them over the weekend just myself. Any potential buyers looking for a lakefront home will be hustling from now until Thanksgiving to find that Perfect Lakehouse! Here in the Poconos, out of 4,167 Homes currently on the Multiple Listing Service, only 114 ( or roughly 3%) of them are actually deemed lakefront so there is a supply and demand issue here. Out of those 114 some buyers would consider about 20% of those homes to be on a Pond as opposed to a lake. Whatever your preference, God is not making any more waterfront property so let's get out there and find that Perfect Pocono Lakehouse! From communities as well known as Lake Harmony-Lake Naomi-Locust Lake Village-Arrowhead Lakes- Towamensing Trails-Big Boulder-Indian Mountain Lakes-Pocono Springs Estates-Big Bass Lake-Split Rock-Blue Mountain Lake Estates-Emerald Lakes-Penn Estates to the little less known communities like Indian Lake-Lake in the Clouds-Pocono Summit Lake-Spring Lake Estates-Alpine Lake-and-White Heron there is inventory albeit the slightest of inventory. For Sellers Looking to get their Lakehouse Sold I say CALL ME NOW! September 2, 2009, not even Fall yet and the overnight lows are dropping down to the low 40's. Thus is life here in the Pocono Mountains of Northeastern Pennsylvania. Before you know it they will be pulling out the Big Guns up Here! That is the Big Two Snow Making Guns at Jack Frost and Big Boulder Ski Resorts!! For those who are unfamiliar with the area we are located approximately 100 miles from either Philadelphia, New York and North Jersey, some even closer. Ever wanted to have that secluded Winter Getaway? With Interest Rates still rivaling the best ever it is a GREAT time to Follow That Dream. Check out my Friendly Links Below for Great Bargains on Ski Resort Living! Please don't hesitate to call me to help you realize that Winter Wonderland Dream!